Coup De Main presents: Mini Mansions' 2015 NZ tour. Sometimes good things happen to those that wait (not very patiently; sorry / not sorry)... and sometimes, bands actually do keep their promises this to you. So, a very fortunate combination of both of this things, has resulted in the good news that New Zealand has been blessed with an upcoming Mini Mansions tour! And what’s more, it’s less than a month away. And we know it's mutual, 'cuz earlier this year we talked to the band’s Michael Shuman, who said of NZ: "To be honest, whenever someone asks me, ‘Where’s your favourite place to go?’ - New Zealand is my favourite place in the world. It really is! I just wanna go - number one, because I want to go on vacation and hang out down there, and also I wanna play for people that haven’t gotten to see us." Click HERE to read our full interview with Shuman. Ahead of their shows with Tame Impala in Australia, Mini Mansions will play Wellington’s Bodega on Wednesday, November 4th, then Cassette 9 in Auckland on Thursday, November 5th. Tickets are on sale now via Under The Radar - click HERE to purchase. "Mini Mansions are a literal force of nature. With player’s rap sheets including bass duties for Queens of The Stone Age, studio collaborations with Brian Wilson and Kimbra, Mini Mansions have produced perhaps the best punk/pop crossover record of 2015. Their new album The Great Pretenders, features both Alex Turner and Brian Wilson, perhaps the two most sought after co-signs in popular music. But who really cares about that stuff? This band are amazing recorded, unmissable live and will definitely be a show you can brag about in approximately 2.5 years when they are on the cover of ________ (insert your favourite magazine here). Punk is no stranger to the individuals who form Mini Mansions, but neither is melody. While they have all played in various DIY bands throughout their youth, they also share a clear affinity for The Zombies, Gorillaz, and Devo. These three members know how to be imaginative and unorthodox, while having a grasp on the levity in nihilism and love, and the fine line in between. Their new album, The Great Pretenders, has been released on T Bone Burnett’s Electromagnetic Recordings/Capitol Records. They are his first signing. The Great Pretenders ambitiously reflects the depth, variety, and musical/compositional interplay between these three distinct individuals. It’s also probably the only record you’ll hear this year that features both Brian Wilson and Arctic Monkeys’ Alex Turner as guests – indeed, its entire song cycle teems with that kind of surprising discovery. The Great Pretenders actually represents Mini Mansions’ third release, following its 2010 self-titled debut album (put out on Josh Homme’s boutique indie imprint Rekords Rekords) and the group’s first self-released EP in 2009. Immediately, Mini Mansions starting playing shows with the likes of Them Crooked Vultures, The Kills, and Haim; the group quickly gained a passionate following for distinctly fantastical, colorfully melodic psychedelic-pop confections that expanded on their shared influences. “When we first got together, we agreed on things like late Beatles, Elliott Smith, early Big Star, and Electric Light Orchestra,” notes Parkford. “But after spending three years playing together, other tastes come out." Wednesday 4th November, Bodega, Wellington. Thursday 5th November, Cassette 9, Auckland. MusicMini Mansions announce new B-Sides release 'Flashbacks' + watch the 'Fiona' music video. MusicCoup De Main presents: Billie Eilish’s first ever New Zealand show. MusicMini Mansions feat. Alex Turner - 'Vertigo' music video [NSFW]. MusicCoup De Main presents... Ellie Goulding's 2014 New Zealand 'Halcyon Days' arena tour! MusicCoup De Main presents: Brockhampton’s first ever New Zealand show. 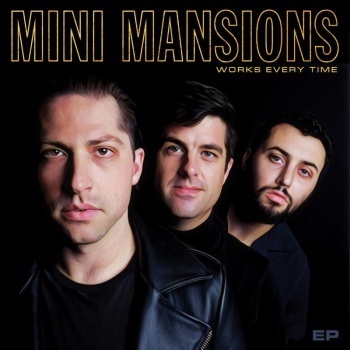 MusicMini Mansions - 'Works Every Time' music video. Music5 things we learnt from Mini Mansions' first [and possibly only ever] Q&A.